Today’s Regional and State Employment and Unemployment report for May was foreshadowed by the dramatic slowdown in employment growth in May’s national jobs report, and it did not fail to depress our economic outlook. Though the national unemployment rate fell from 5.0 percent to 4.7 percent in May, it was at least partially caused by people exiting in the labor force (rather than finding jobs), and it was accompanied by a measly employment growth of 38,000 jobs. At the state level, this meant that a slight majority of states (27 states) actually had their total employment decline from April to May. May’s poor employment growth could very well be a blip, but it does follow two prior months of less-than-stellar growth. 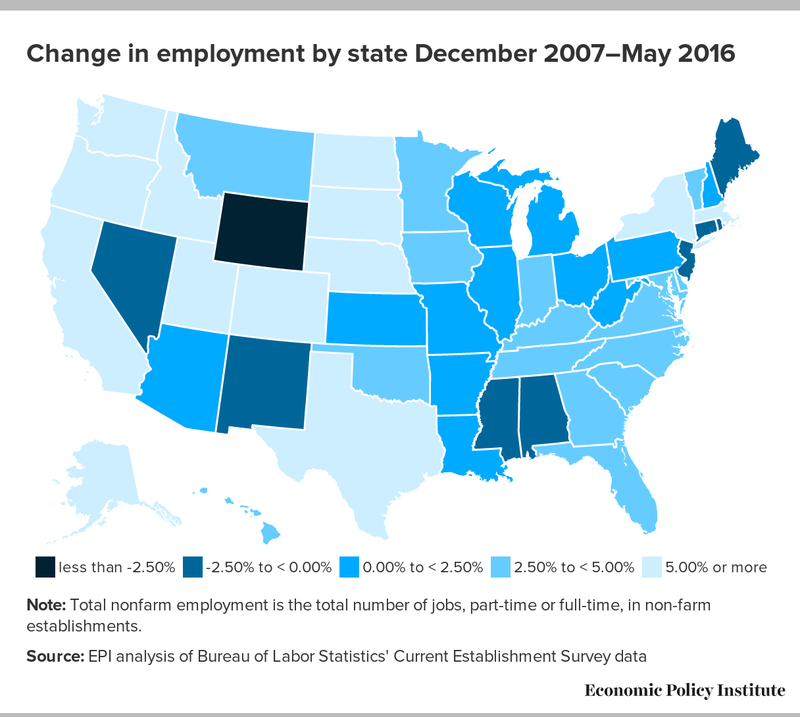 17 states experienced employment declines from February 2016 to May 2016. The largest declines occurred in Wyoming (-1.2 percent), New Hampshire (-0.6 percent), and North Dakota, Tennessee, and Virginia (-0.4 percent). Over the same period, 33 states and the District of Columbia had positive employment growth. The states with the largest gains were the District of Columbia (+1.3 percent), West Virginia (+1.2 percent), and Maryland (+0.9 percent). West Virginia is of particular interest since it had been losing jobs along with many of the other energy-dependent states over the past year and a half. Looking at the employment growth by sector, West Virginia’s recent growth seems to be explained by a sizeable gain in its public sector, increasing by 7.2 percent (or 11,000 jobs) from February to May. 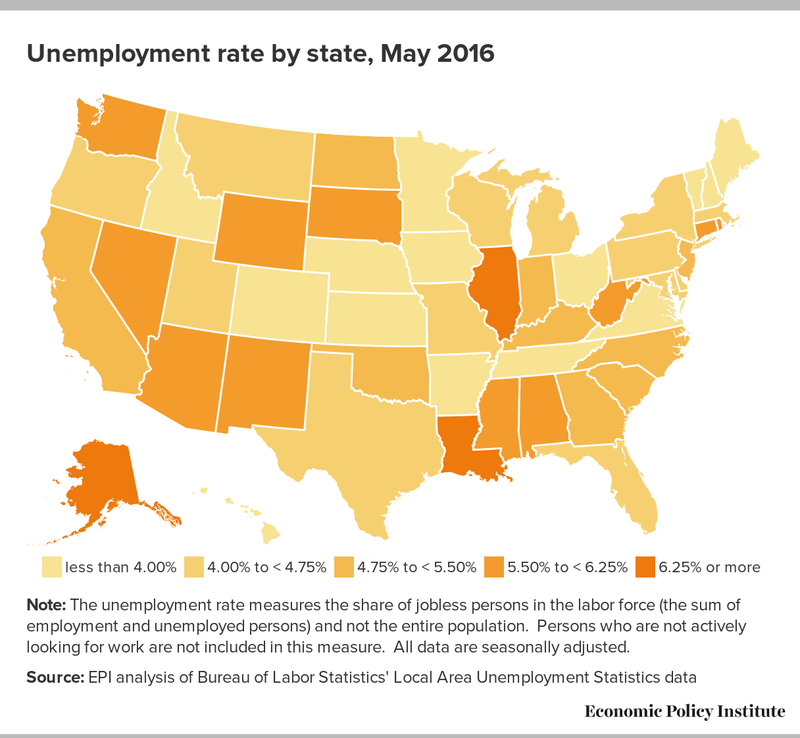 From February 2016 to May 2016, 26 states and the District of Columbia had their unemployment rates decrease. The largest improvements occurred in Tennessee (-2.4 percentage points), Ohio (-1.8 percentage points), and Kentucky and Mississippi (-0.7 percentage points). Over the same period, 19 states experienced increases in their unemployment rates, led by South Dakota (+2.9 percentage points), North Dakota (+2.2 percentage points), and Utah (+1.0 percentage points). In light of the apparent deceleration in job growth, the Fed’s decision to hold off on raising interest rates at its June meeting was a welcomed decision. In addition to encouraging stronger employment growth, low interest rates remain essential to spurring faster wage growth. Beyond monetary policy, there are plenty of other policies we can pursue—such as investing in early childhood education, easing collective bargaining, and strengthening labor standards—that will allow more people to work and ensure that work is properly rewarded.